Sonia Velazquez is a skilled Medical Assistant. She is taking classes at City College of San Francisco to obtain a major in Health Education and become certified as a Spanish Health Care Interpreter. Prior to joining SOS, Sonia worked as an Access Coordinator at one of SFCCC’s primary care clinics. Welcome Sonia! Ilse GavinoVargas is a graduate of Cal State Sacramento. She has strong customer service skills and many years of personal experience advocating for family members in the local healthcare delivery system. She is a native Spanish speaker and is interested in pursuing a career in medicine. Welcome Ilse! Vet SOS launched an electronic health record in March and said goodbye to paper charting! Evet Practice is veterinary software designed by vets for vets, customizable for our outreach-based practice. 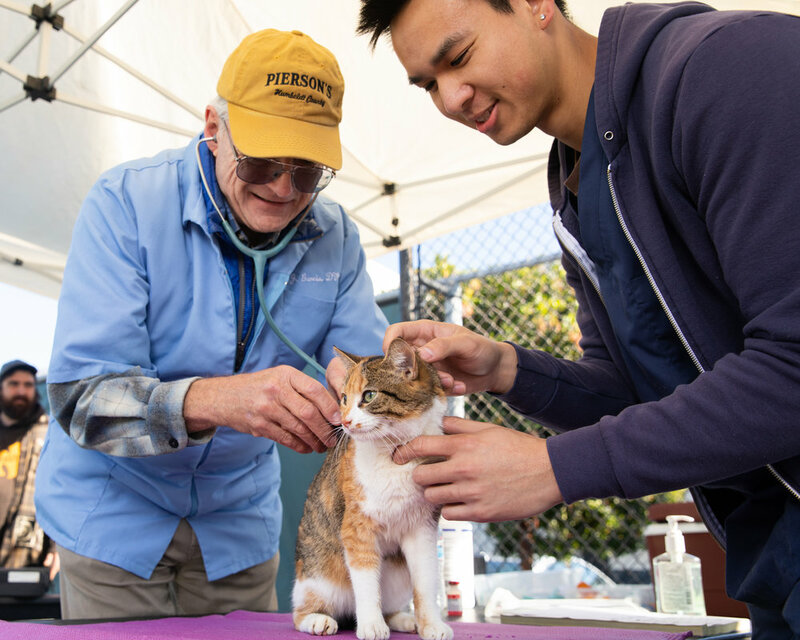 It’s a cloud-based system and provides convenient mobile access at our monthly pop-up clinics for the pets of homeless San Franciscans. Easy to use, it allowed our staff to train all volunteers on-site and see 30 pets the first day. Two paws up for this exciting new development in Vet SOS! Meet Dorlee (left in photo), one of our most beloved nurses who has been volunteering on our SOS van for over 7 years! Now retired, Dorlee spends her time as a hospice nurse and volunteering with SOS. Her favorite part of working on the van has been meeting clients, providing urgent care, giving support when needed, and being an advocate for our clients. For anyone that goes into the health care field, Dorlee recommends that they volunteer and spend some time on the van because that is how "you learn about humanity and people." We couldn't do the work we do without volunteers like Dorlee. Thank you for all you've done for SOS, our clients, and our community! SFCCC, SOS, and Vet SOS want to thank you for your support over the years. With your help, we have been able to extend our SOS team and implement a new EHR for Vet SOS, in addition to providing care to over 1000 homeless San Franciscans last year. If you would like to support SOS/Vet SOS so that we can continue to serve homeless clients and their pets in 2019, please consider becoming a monthly donor today! Every donation makes a difference in supporting our vital services. Without your generous contributions, our programs could not meet the needs of our community!